It wasn’t a perfect season, but when it counted Labrador played their best footy. The Tigers’ 2016 campaign is the perfect example of the footy cliché that premierships aren’t won in May. At 2-4 after six rounds, things were looking glim, but once they turned for home at the half way point of the year, they didn’t lose another game. 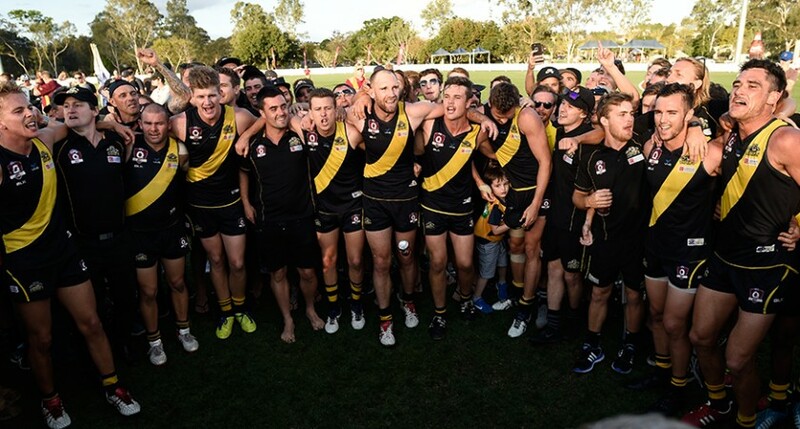 They didn’t put a foot wrong in the finals, romping home to a 53-point Grand Final win. Interestingly enough, after three Grand Finals and two premierships, they are now the most successful team in the modern QAFL era. The obvious is lifting the cup for the second year in a row, but there were a few others along the way. A 114-point win over Broadbeach in round 17 was about as good as it gets for a home and away game, but they also recorded mammoth wins over Sandgate and UQ throughout the year. They had five in the Team of the Year, and Wayde Mills was voted by the coaches as the Syd Guildford Award winner. I think the loss that hurt the most came in round 4 at the hands of Surfers Paradise. The 75-point defeat left them scratching their heads. They were never in the game, and it threatened to derail their season. That they were the best team in the QAFL, and that the future is just as bright, with the amount of young players they got games into, and who played well. Wayde Mills was nothing short of outstanding this year, deservingly named best on ground in the Grand Final, as well as taking out the Syd Guildford Award. Billy Hicks had another great year, Bryce Retzlaff, Josh Baxter and Jake Goldsmith were all singing from the same hymn book in the forward line, and Adam Clarke took his inside game to a new level. There were a few this year like Rhys Coombe and Dane Watmuff, but the biggest surprise packet was Charlie Offermans. In his very first year of club footy, Offermans was a revelation. He is quick, agile, and strong through the hips. With American College basketball teams knocking at his door, he has a big decision to make half way through next year. To be honest, not a whole lot. If they are able to retain the majority of their list they are going to be very strong again. Blake Bantoft should slot back into full back once his knee comes good, which makes them even more formidable in that half. If they are going to target anyone this off-season, another runner though the midfield/on the wing would be high on their agenda, because the talls are all stars.